I don’t mind saying...I do love a good droolworthy calendar. Back in the day when I actually shopped as a past time, as soon as the calendar stands started to appear in shopping centres towards the end of September, I would stop to browse and end up spending ages trying to decide which food calendar to keep an eye on, hoping against hope it would come on special before it sold out. Then I started working for Thermomix in Australia. First job was the Taste of Vegetarian cookbook, still a best seller today, but there were no pictures! I was so sad about that. As is usual with me, I had a brilliant idea at about 4 in the morning. What if we did a foodie calendar? 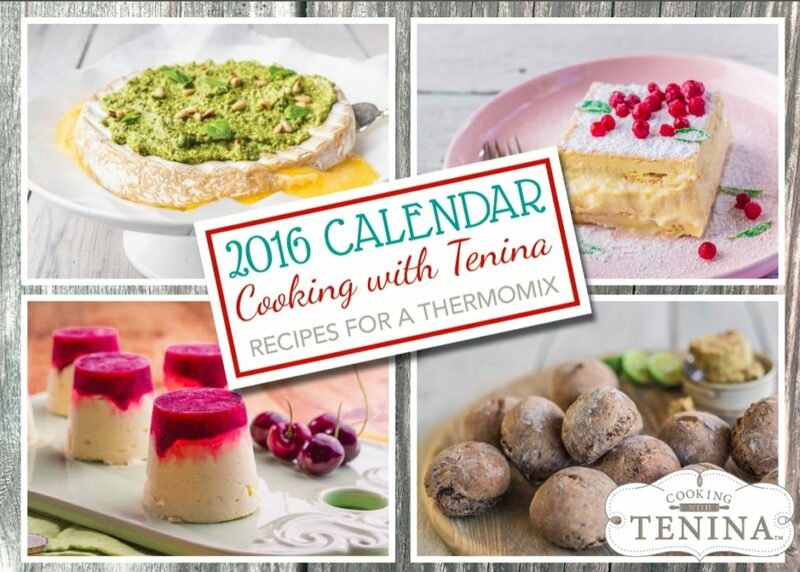 I was pretty obsessed with the idea, not just because I loved calendars myself, but because I felt as though (back then) that there was a real need to showcase the Thermomix in a foodie light. To date it had pretty well been stuck in the hippy-healthy-hairy-armpits-sit-around-the- campfire-and-sing-kum-bah-yah demographic and I loved it for so much more than that. I wanted to tell everyone; LOOK WORLD, this machine can do amazing stuff and it’s EASY....and delectable and beautiful and classy and well...gourmet! Anyhoo, I managed to convince Grace (yes, that Grace, the Mazur Grace, owner and distributor for Thermomix in Australia) and so the project began. I had my list in about 10 minutes. But it then had several weeks of reworking that list before we actually were ready, but in it of course we tried to showcase all the things that the Thermomix is good at doing, which is logical. I was working for an appliance company, not a food company. And then, rather than do a photo shoot, we bought stock images...and hilariously, I had to tweak the recipes accordingly. Parsley in the picture? Parsley went into the recipe. No picture available of lemon cake? Change the recipe....it was fun. But frustrating at the same time. So I am really proud to offer you something I am really passionate about. We have carefully chosen the best recipes from across all of the areas of my publications, plus plenty of new and exciting ones. We have put them into a beautifully glossy calendar, simple so that you can use it to run the household scheduling but more importantly, all about the food! AND, it’s cheap...AND it has FREE shipping, AND we’re offering a bulk discount. That pretty much means that if you have family, friends, teachers, colleagues who have a Thermomix, you can sort their gifts out in one hit! The best part about purchasing a calendar from me is that we are going to include a special never before seen digital recipe that will be emailed after your purchase directly to your inbox. This recipe is a delectable dessert (of course...you know me by now don’t you?) and the only way you can get this recipe is by purchasing the calendar. We anticipate they won’t last long. We are only printing a limited number, given the time frame of calendars...and we hope you will be on that exclusive list.